(Newser) – The Green New Deal is here. 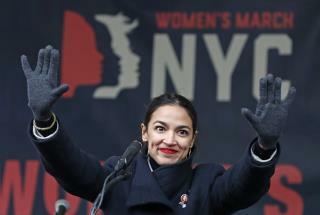 Alexandria Ocasio-Cortez unveiled a resolution on Thursday that would give the US a blueprint on how to wean itself from fossil fuels and remake the American economy in the process. Sen. Ed Markey of Massachusetts is introducing a companion proposal in the Senate. As NPR explains, this is a nonbinding resolution, which means it would not create laws—instead, it urges "10-year mobilizations" for a series of ambitious goals. The resolution: Read it here. You can read a blog post FAQ here. 2 big goals: The resolution calls for "meeting 100% of the power demand in the United States through clean, renewable, and zero-emission energy sources." It also seeks to protect Americans whose jobs are at risk during this transition, particularly the poor; the resolution calls for a guaranteed job "with a family-sustaining wage, adequate family and medical leave, paid vacations and retirement security" for all Americans. Throwing shade: Nancy Pelosi sounded a little dismissive in this quote to Politico, saying that the "green dream or whatever they call it" will be just one of several proposals on climate change the House will consider. In fact, Pelosi picked eight Democrats to serve on a special committee on the issue Thursday, and AOC was not among them, notes the AP. IMO the Democrat leadership in Congress are using AOC as political chum, seeing what sharks are attracted with her wild splashing and crazy antics. She'd better wise up before she becomes irrelevant even to the other loonies on the far left. Pelosi and crew are just using her, and when they're done with her she'll be the Democrat equivalent of Don Quixote. it is only the thoughtless, ill-informed and mindless - the trump cult -who refuse to accept the truth about climate change. Why should they care - it won't affect them for the most part - they'll be done. It is the future generations who have to pay the cost.